Bunco wine glasses are hand painted and make a great gift for the Bunco winner. Do you want to be the hostess with the mostess? Or are you content for settling with having an average night at Bunco where everyone leaves early and yawning? Heck no! You want to live it up and make your Bunco night one to remember! You want those gals and friends talking about the great time they had at your house because – because you had specially painted Bunco wine glasses for the night while you enjoyed the game and friendship. Are there Bunco wine glasses? Imagine walking into a Bunco night and being handed a glass full of your favorite cocktail. Sounds right so far! But this glass is different. It is hand-painted just for you – the Bunco player. 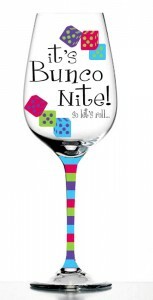 The wine glasses are beautifully hand painted with dice and words to match any theme for bunco night. The Bunco Wine Glasses sits on a skinny stem that is striped in colors of red, green, blue and purple. Color coordinated dice are on the body of the glass, making it for a festive and colorful piece of glassware. The Bunco Wine glasses hold twelve ounces. For best results, hand wash in warm water and leave out of the dishwasher. The Bunco Wine Glasses make for a great hostess gift if you are taking one to your friend who is hosting. Imagine how popular you will be! It can also be given away as the top prize for the night to the winner. Imagine how hostile the rolling would be if the girls new what the ultimate prize was for? Chances are, the Bunco wine glasses will be so popular, the gals will go out and buy their own to have and bring to each person’s house on Bunco night if they are not the big winner. Makes for a great addition to any wine themed bunco night.